Points : 4 out of 5. 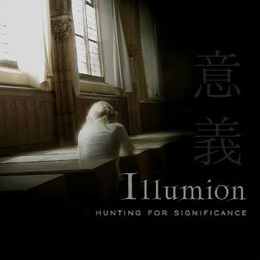 Hunting for Significance is Illumion's second release. I was lucky enough to review their debut album The Waves, and enjoyed every minute of the album. This sophomore album continues the power and grace of their female lead style with even deeper impact. This time they have enlisted a wonderful artist in Jankees Braam. His artwork truly helps emphasize the message in the lyrics and music. Esther Ladiges on lead vocals along with Eveline van Kampen on supporting vocals is another great combination for this album. The two ladies combine to bring both emotion and powerful delivery to bear on this album full of stories. One of those great stories is the opening track "Encomium", with its serious ecological warning. Ladiges sings, "Depurate the air with lies. Deracinate the trees with rice. Immortal poets devocalized. While perdition is at rise". Very powerful lyrics and imagery with which to open an album. Ladiges drives home the point well, "Hunt down animals on the sly. Support the world's political vice. Hearken our extinction cry. Who dares to close the eyes? Is this all we want?" I think they will get your attention early. "Scarlet Sin" is another deep lyrical journey. This time the subject is Oscar Wilde's A Picture of Dorian Gray. Van Kampen's lead guitar and Peter Boer's heavy bass help create a deep rich soundscape from which Ladiges expounds, "The canvas so enthralling. Became more loathsome day by day. Anxious thoughts overwhelmed him so. The knife shall have the final say". Illumion do a great job capturing the deep depressive mood surrounding this story. About time for something more upbeat eh? Well, "Chrysanthemum" opens with sparkling keys and soft female vocals from both ladies before the lyrics inspired by the Curse of the Golden Flower unfold and bring back the darkness. The erhu and flute add even more drama to the chilling lyrics and storyline. "Into the Labyrinth" is one of the best tracks on the album. The wonderful guitar that opens the song will take you back to legends of progressive favorites. Ladiges vocals and soft whispers from van Kampen add more mystery and suspense to the mix. At times, Ladiges even conjures the power of mystery that only a Kate Bush has been able to weave well. The intricate guitar work must be experienced. The hollow drum effects are a great nuance to the mix. The track was inspired by The Labyrinth of Budapest. "Metamorphosis", inspired by Franz Kafka's The Metamorphosis, is another great adaptation of a story of literature for a musical masterpiece. Some of the album's best lead guitar soloing are combined well with excellent bass support. "Prophecy" opens with some excellent soaring lead guitar riffs well supported with bass and keys. Ladiges sings some more deep lyrics, "The tormenting wheel of fate. Like a used arrow on a slate. A storm of thoughts so intense. Life begins where delusion ends". The keyboard solo will bring back memories of Tony Banks, but you will wish it could have gone on longer. There are many dark subjects found during this hunt for significance. A musical exploration of Edgar Allen Poe's, The Pit and the Pendulum is examined on the track "Under the Harrow". "Died for Beauty" is full of powerful lead electric guitar solos, orchestrated strings and deep bass. "Infinity" was inspired by The Mountain Tree, by Zhuangzi and Auguries of Innocence by William Blake. Ladiges sings passionately, What if I gave it all? What if I gave you all? What if I ruined it all? What if I didn't do anything at all? How am I supposed to live when all I love dies around me? Give me a glimpse outside my eyes". Yes profound lyrics inspired by a hunt for profound stories within literature performed well to a striking musical score full of violin and viola. "Whirlwind" opens with a strong lead electric guitar guiding the flow of the sound. Ladiges vocals and the soft piano provide the perfect balance to the sound. "The Bliss" opens with powerful drums, bass and lead electric guitar. However, Ladiges vocals rise above, "Looking up through the water. Surface light and green seaweed. Shining through outrageous blue. It all became clear to me". The lead electric soloing on this track is excellent, but so is the bass and drum support. The ending keyboards weave the best mystery of all. Wish there would have been more throughout the album. You will hear sounds that harken back to The Lamb within this mini keyboard symphony…and you will smile. Another power – packed album from Illumion. Two in a row. Yes, they definitely will remain a part of my "watch list".